At The Porch at 30th Street, the hungry masses can feast on comfort food served up at Rotisserie, the latest venture from Michael Schulson of Sampan fame. Many were dismayed last spring when University City District unveiled plans for "The Porch 2.0," a makeover for its outdoor space at 30th Street Station that didn't include a plan for the food trucks so often parked there. 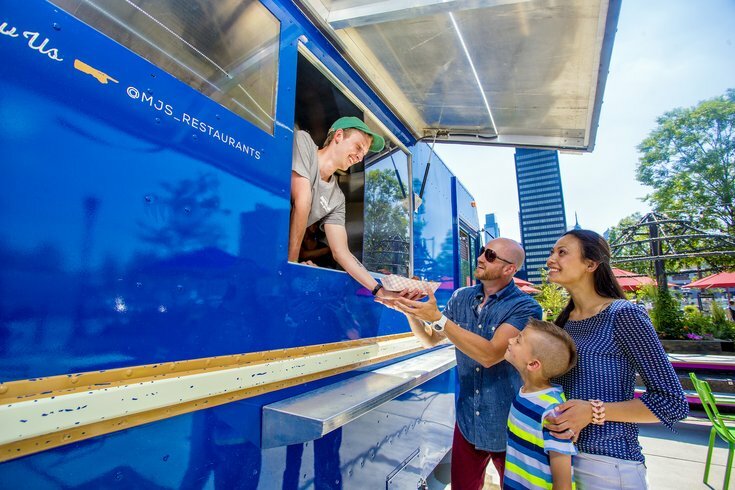 UCD brought in its own truck, Rotisserie by chef Michael Schulson (of Sampan and Independence Beer Garden), with a happy hour and a philanthropic concept, plus more decor, lighting and seating. But it nixed the fan favorites that rotated during the warmer months at the site, providing local lunch-goers with much-needed variety. Well, worry no more, food truck lovers! UCD announced that it has partnered with the Philadelphia Mobile Food Association to bring grub back to The Porch Mondays through Fridays, April through October. Selected applicants will rotate through two lunch spots and one breakfast spot a day. According to Billy Penn, Schulson's contract at The Porch was up for renewal after last year and he decided not to renew it. Which, we imagine, local mobile vendors must be super psyched about. Stay tuned for more news as The Porch announces upcoming vendor options for the spring and summer seasons.